Imagine the unimaginable... What would the world look like if America did not exist? Did America steal the country from the Native Americans? Much of this critique focuses on Columbus and the actions of the Spanish conquistadors. But Columbus never even landed in America. And the actions of the Spanish, that was 150 years before America. Slavery existed all over the world... What's uniquely Western is the abolition of slavery. And what's uniquely American is the fighting of a great war to end it. America: Imagine the World Without Her is a 2014 American political documentary film by Dinesh D'Souza. Capitalism works not through coercion or conquest, but through the consent of the consumer. And how badly we need right now a Washington, a Lincoln, a Reagan. Well, we don't have them. But we do have us. Directed by Dinesh D'Souza and John Sullivan. Produced by D'Souza and Gerald R. Molen. Written by D'Souza, Sullivan and Bruce Schooley. Based on D'Souza's book of the same name. I love America. I chose this country. And like millions of immigrants, I've been blessed by my life in America. This country does something truly unique. It allows you to write the script of your own life. These are the indictments against America: We stole the country from the Native Americans. We took half of Mexico in the Mexican War. We stole the labor of the African Americans. And today our foreign policy and our free market system are forms of theft. These indictments developed separately and each has been around for a long time. But now they've come together in a single narrative of American shame. [...] Are our lives, innocent on the surface, part of a ruthless engine of looting, exploitation and murder? It's a powerful critique. We can't just dismiss it with chants of liberty, freedom, rah, rah, rah. The critics are raising the primary question of justice. Read the Declaration of Independence. It's a cry against injustice. For the American Founders, liberty was the solution to that injustice. This is not just an attack on the 1%. It's an attack on all of us. We are a nation of immigrants and settlers. And we are the ones accused of these crimes. [...] If our wealth is stolen, then we must give it back. So, is America guilty as charged? It depends on whether the story of American shame is true or not. Most countries are founded in conquest. Europe, conquest, conquest and more conquest. Look at Britain. Before becoming an empire, it was conquered by the Norman kings of France and earlier by the Romans. Before the British came, India was invaded by the Persians, the Mongols, the Afghans, the Arabs and Alexander the Great. Conquest was how wealth was acquired. Not through entrepreneurship, invention or business. Historically, every culture has despised entrepreneurs and merchants. In India, we have the caste system. Who's at the top? The Brahmin or priest. The entrepreneur is one step from the bottom. The Islamic historian Ibn Khaldūn says that looting is morally preferable to entrepreneurship or trade. Why? Because looting is more manly. In looting, you have to beat the guy in open combat to take his stuff. America is based on a different idea. The idea of acquiring wealth not by taking it from someone else. Instead, wealth can be created through innovation, entrepreneurship and trade. Let's take a look at Manhattan. Reportedly in 1626, Native Americans sold Manhattan to the Dutch for $700 in today's money. There's land all over the world now that you can buy for $700. But when the Dutch bought Manhattan, there was no Manhattan. Prices are astronomical today because of what's been built over the past 300 years. Manhattan is the creation of the people who built it, not the original inhabitants who sold it. Manhattan represents the new American ethic of wealth creation. An alternative to conquest. Land possession is part of a long history in which the stronger Native American tribes displaced weaker ones. The Native Americans, too, subscribe to the conquest ethic. But what about the charge of genocide? In the two centuries after Columbus, the Native American population declined by 80%. But it wasn't due to warfare. Rather, as historian William McNeill points out, they contracted diseases, measles, typhus, smallpox, cholera and malaria, to which they had no immunities. Now, this is tragedy on a grand scale, but it's not genocide because genocide implies an intention to wipe out a people. Just a century and a half earlier, one-third of the population of Europe was wiped out by a series of bubonic and pneumonic plagues. Those plagues came from Asia, and the Europeans had no immunities. We don't call that genocide. For the first time in history, a great war was fought to end slavery. 300,000 Northern soldiers died in that war. They died to secure for the slaves a freedom that the slaves were not in the position to secure for themselves. Even the Civil Rights Movement was not a break with the American founding. [...] Where did Martin Luther King get his 'promissory note'? Not from the segregationists. He got it from the Declaration of Independence. It was the American founding that established the principles that made possible the success of the Civil Rights Movement. The topic of race, more than any other, generates taboos. And taboos are the enemy of history and of truth. In the early 17th century when slavery started in America, another group was brought to this country by force. They were white indentured servants. Starting in 1618, children were captured from the streets of London and sold into colonial America. But it didn't stop there. Over the next century and a half, another 150,000 Irish men, women and children were declared soldiers of war by Britain and sold into colonial indentured servitude with many landing in Virginia and New England. Indentured servitude was not slavery. It didn't have the same ideology of racial dehumanization. And it was for a limited period, typically seven years. Yet, these people often had their term extended or died before they got their freedom. Indentured servants worked side by side with slaves. For many years, white indentured servants outnumbered black slaves. Gates and other scholars estimate that in the period before the Civil War, there were approximately 3,500 free blacks who owned more than 10,000 black slaves. In South Carolina and Louisiana, Gates points out, the percentage of free blacks who owned slaves was approximately the same as the percentage of whites who owned slaves. Slavery existed all over the world. The Egyptians had slaves. The Chinese had slaves. The Africans did. American Indians had slaves long before Columbus. And tragically, slavery continues today in many countries. What's uniquely Western is the abolition of slavery. And what's uniquely American is the fighting of a great war to end it. Whatever you think about the Vietnam War, America wasn't stealing from the Vietnamese. And in Iraq, we spent a whole bunch of money and then we turned over the oil fields to the Iraqis. Under the conquest ethic, we would have kept it. In Afghanistan after 9/11, the US military, even while bombing terrorist targets, was delivering food rations to Afghan civilians. And far from stealing, America rebuilt Germany and Japan after World War II. Contrary to the Zinn narrative, we're not the bad guys of the world. As Colin Powell said, "The only land that America asks for abroad is land to bury our dead." Steve Jobs, did he rip people off? He created products that people didn't even know they wanted or needed. But once he made them available, they clamored for them and stood in line to buy them and freely spent their money for them. There's no rip-off. Capitalism works not through coercion or conquest, but through the consent of the consumer. Does capitalism promote global injustice? From businesses in the Middle East to factories in South America to entrepreneurs in China, the world is embracing the free market. Does it seem to you ironic that this sort of entrepreneurial capitalism, that this recipe has become so controversial at home here while it is being enthusiastically embraced in so many other parts of the world? So is the wealth of America based on theft? Actually, no. The wealth of America isn't stolen, it's created. The ethic of conquest is universal. 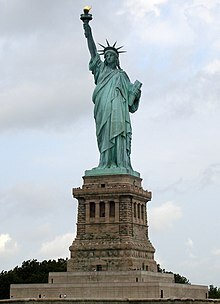 What's uniquely American is the alternative: equal rights, self-determination and wealth creation. If America did not exist, the conquest ethic would dominate the world once again. America isn't the problem. America is the answer.